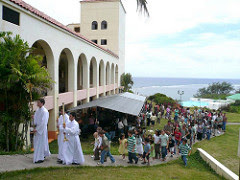 Overlooking Ylig Bay in Yona, one can view the spacious land and facilities that have become the Redemptoris Mater Archdiocesan Missionary Seminary of Guam. The name is Latin for “Mother of the Redeemer.” It was established on December 8, 1999, by Archbishop Anthony S. Apuron, OFM Cap, DD, Archbishop of Agana, for the purpose of training future priests for missionary work in the New Evangelization called for by the late Pope John Paul II. Recognizing the serious challenges Guam is facing today because of secularization and the serious shortage of priests, Apuron created the seminary – the first ever in Guam’s four-hundred years of Catholic history. The first site of the Redemptoris Mater Seminary was at the prior Father Duenas Minor Seminary in Tai, which had been closed for some years. In December of 2002, the former Accion Hotel overlooking Ylig Bay became available for sale and the Archdiocese purchased the site for the seminary. Fortunately, the seminary began moving to its present location as, that same month, Supertyphoon Pongsona destroyed the Tai seminary building. The Yona seminary is now home to thirty-three seminarians from thirteen countries. On May 21, 2005, Alberto Salamanca, now pastor in Barrigada, was the first seminarian to be ordained a priest from this seminary. Redemptoris Mater also houses the Blessed Diego Luis de San Vitores Catholic Theological Institute for Oceania named after Fr. San Vitores, a Jesuit priest who established the first Catholic mission on Guam in the seventeenth century. This institute is now an affiliated philosophical and theological institute to the Pontifical Lateran University of Rome. It provides the philosophical and theological formation to seminarians studying for the Archdiocese of Agana and is open to all seminarians from the Pacific. The seminary is run according to the spirituality and methodology of the Neo Catechumenal Way, an itinerary for Catholic formation. It is one of seventy such seminaries staffed by priests of the Neo Catechumenal Way all over the globe. Students at the seminary come from many nations and will be sent on international mission throughout the world. There are students from Guam and some, when ordained, will also serve on Guam. The seminary has a very international dimension because the seminarians come from different countries, thus overcoming the sole allegiance to a particular nation and visibly promoting the Catholic belief that people are one in Jesus Christ. 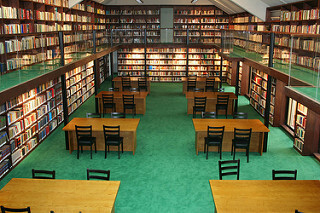 The seminary now has a sizable specialized theological library, three classrooms, and two conference rooms. 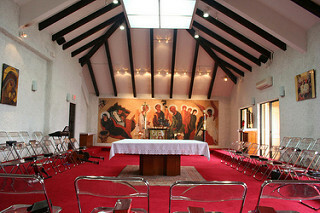 A chapel has been built for seminarians to pray and express their faith. The facilities at the seminary are used for functions of the Neo Catechumenal Way and also for periodic archdiocesan events. The seminary is in the process of establishing a theological institute. Both the seminary and the theological institute operate exclusively on volunteer help.